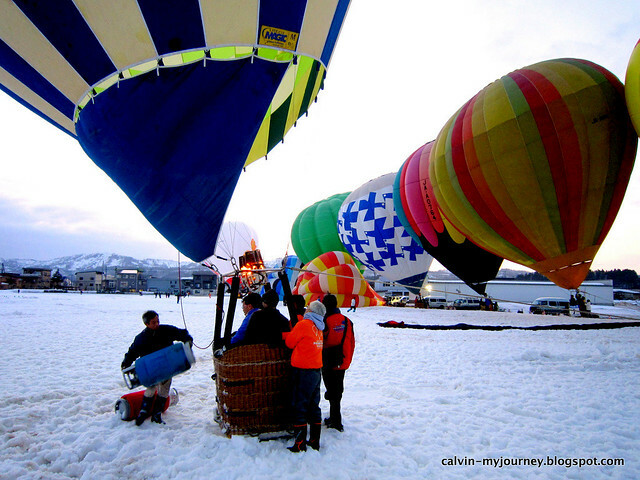 Imagine this - Close to fifty colourful hot-air balloons flying above a wide open space covered with snow. Sounds like an interesting sight, isn't it? 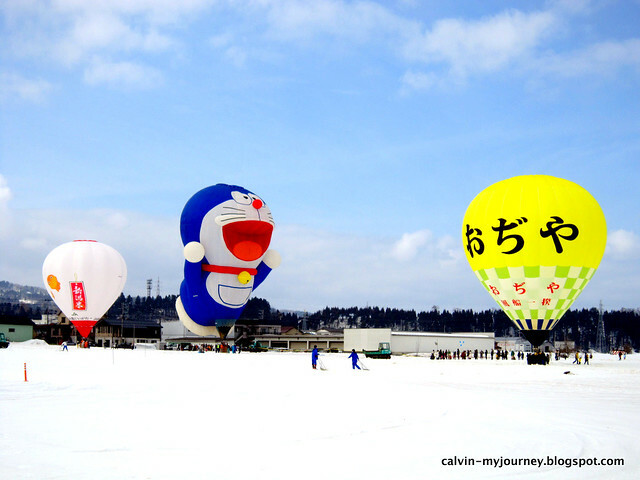 That was the reason I made a trip to visit in late February last year to the "Ojiya Hot-Air Balloon Festival" or also known in Japanese as 小千谷風船一揆 (Ojiya Fūsen Ikki), which was held in Ojiya city, a neighbouring city of Nagaoka in Niigata prefecture. 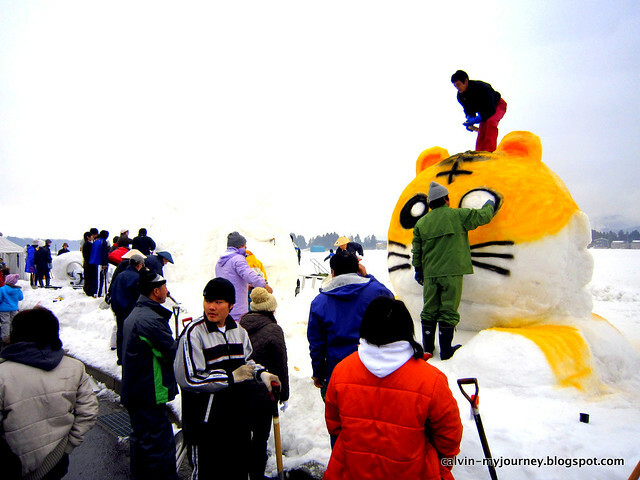 It is an annual event which was first started in 1977 and held towards the end of February in a wide area of rice fields nearby the town centre. 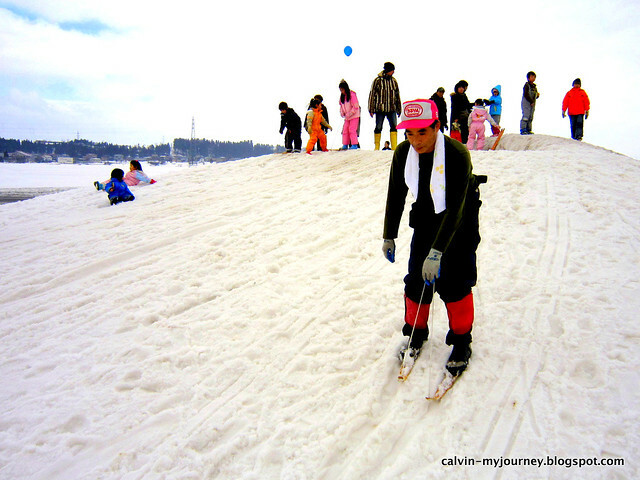 Since it is still winter, the area is always covered with a thick layer of snow, which makes it looks like a snow field. 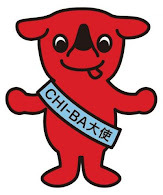 A signboard at Ojiya station to welcome visitors to the city. Hot-air balloons however, isn't the only thing that this city is famous for. Ojiya city is known as the centre of the Japanese koi industry. 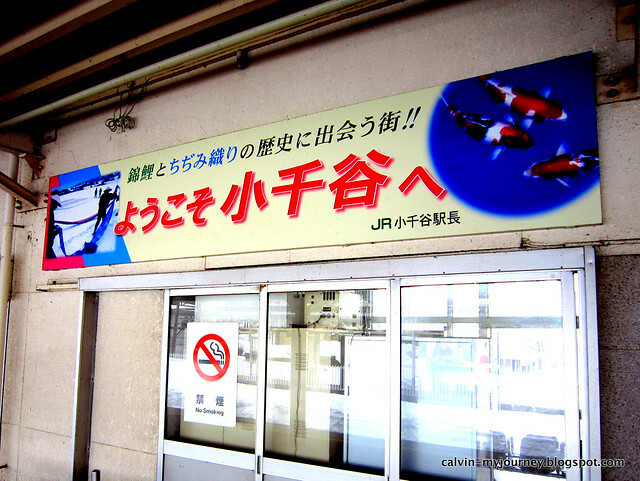 People who are familiar with koi should know that Niigata prefecture is a synonym for koi. 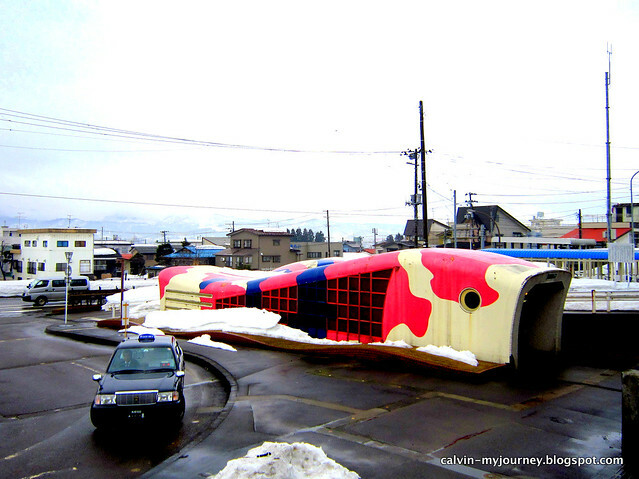 Koi is believed to be born in the mountains between Nagaoka and Ojiya. This rural and mountainous area was completely isolated during the winter season, where thick layers of snows cover the area during the olden days. Living in such harsh environment, the farmers living in this area relied on a simple diet of rice and carp. The carps were kept in ponds close to their houses. However, the carps were later kept for their ornamental value when red mutants were discovered in the 19th century. This is how the koi industry in this area begun, which later attracted interests throughout Japan and eventually spread worldwide. The underground passage, which resembles a Japanese koi. Ojiyans just love their koi very much, don't they? 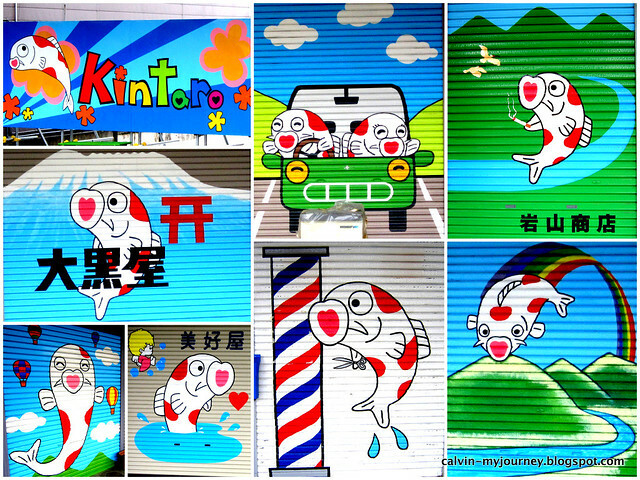 Colourful and cute paintings of kois on the steel grill of the shops in the town. Besides the main attraction, which was the hot-air balloons, there were other side events at this festival as well. 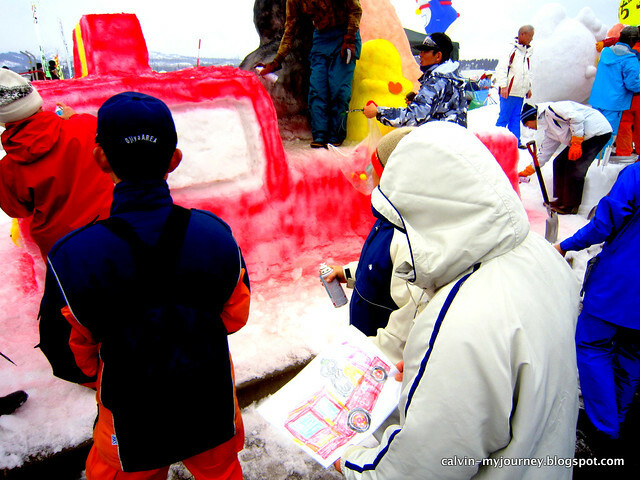 One of them was the "Snow Sculpture" contest, where a number of groups from various organisations participated in this competition. I was lucky to be able to catch this competition as they have just started their sculpturing when I arrived at the venue. 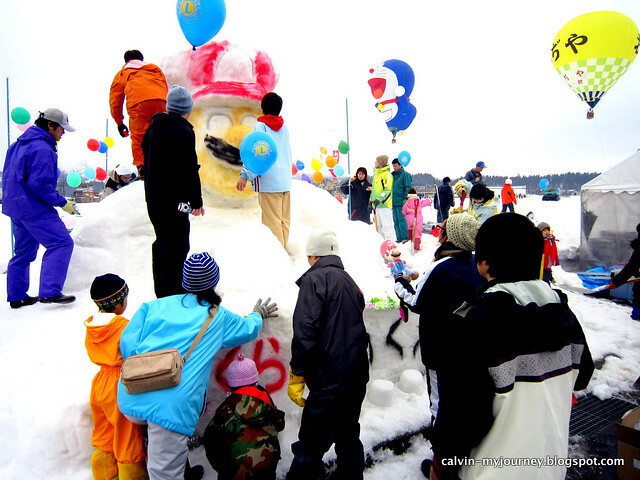 Most of the designs used for the snow sculpture were familiar characters such as the only-cat-in-the-world-without-a-mouth (read: Hello Kitty), Totoro, and Mario. The venue was already filled with visitors early in the morning. 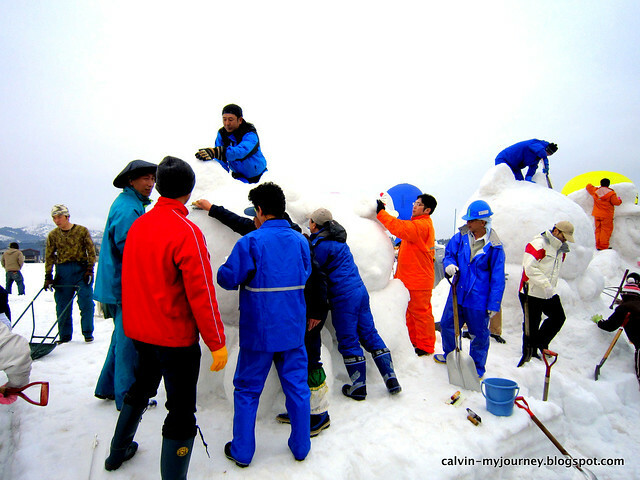 It takes a team effort to produce a large-sized snow sculpture in just a matter of few hours. Once the shape has been created, it is time to put some paints on it. This one looks very much like Maybank's mascot haha! 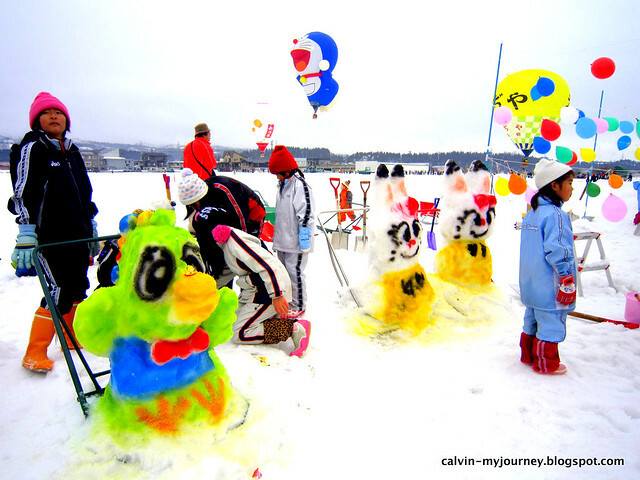 As for the kids, they made smaller snow sculptures, to be placed around to the main ones later on. Some even brought the sketch of their masterpiece to be referred while they complete their snow sculpture. One of the teams posing in front of their completed masterpiece. 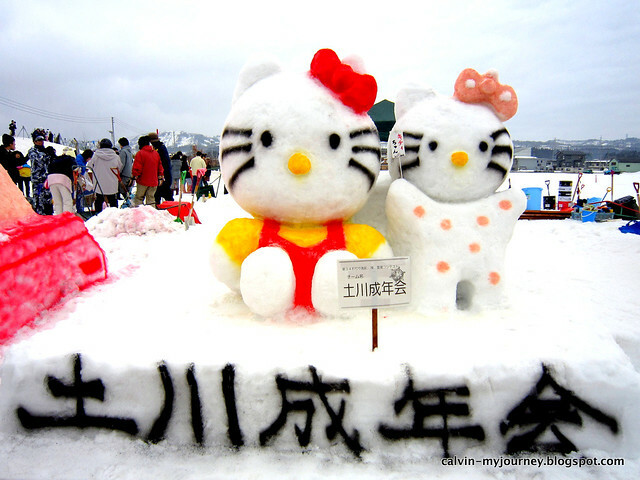 Hello Kitty and his partner? Totoro shows the "peace" sign. 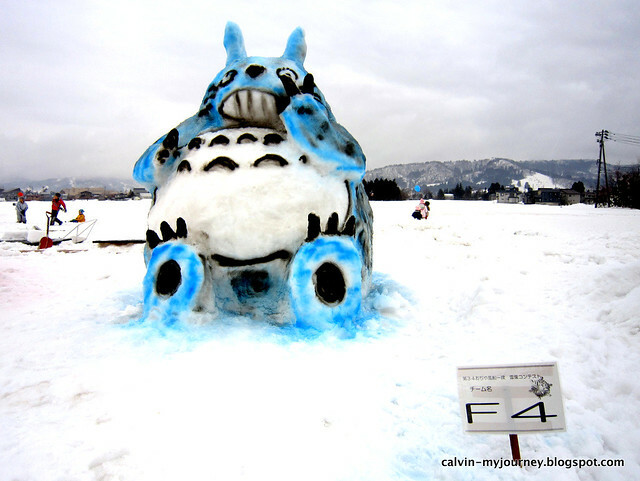 However, this Totoro looks quite scary haha! 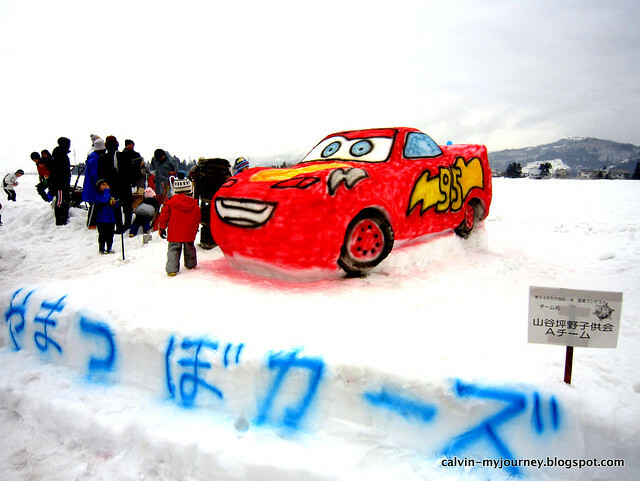 Lightning McQueen, the red race car from the animated film Cars. 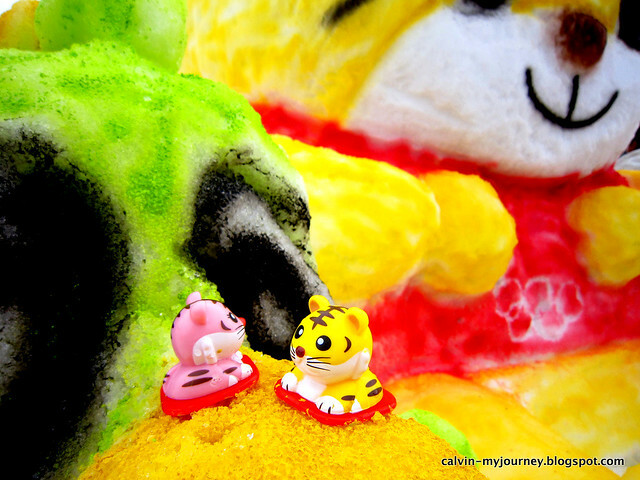 When a yellow tiger meets a pink panther tiger. 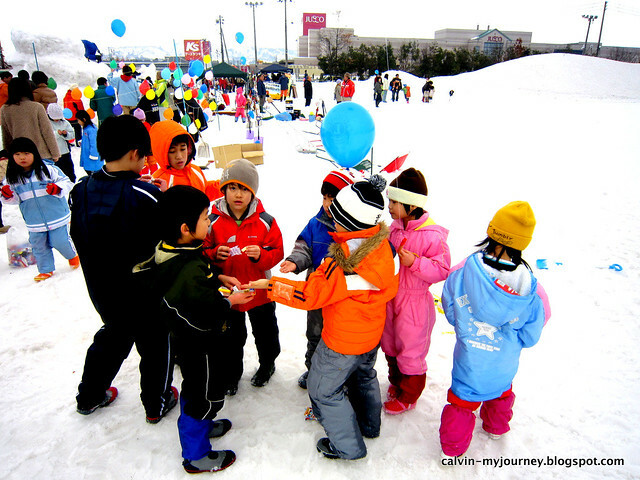 Besides the snow sculpture competition, there were stalls being set up by community organisations and neighbourhood associations, which sell various kinds of food of local specialties. 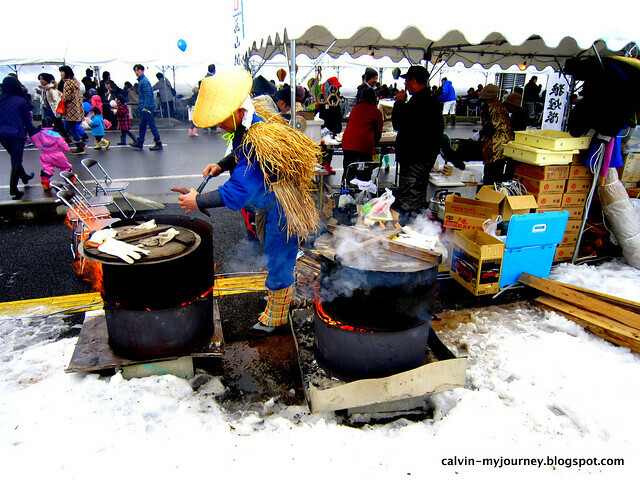 The food that enjoyed the best business in the cold and chilly day were mostly hot food such as miso soup, freshly grilled yakitori and takoyaki, as well as yakisoba hot from the pan. 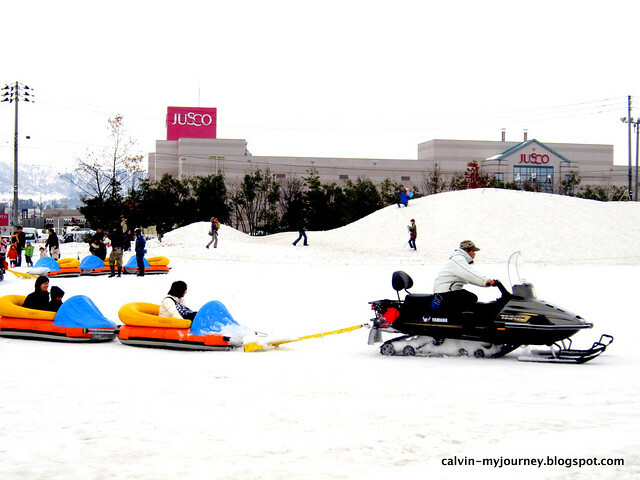 Other side events included snow sleigh rides that take visitors go around the open snow field. This kind of ride looks fun, isn't it? Small kids with their whatever-it-is games lol! Playing paper-scissors-rocks to determine the winner for some games. One of the uncle from a stall that sells baked sweet potatoes that produced really good aroma. 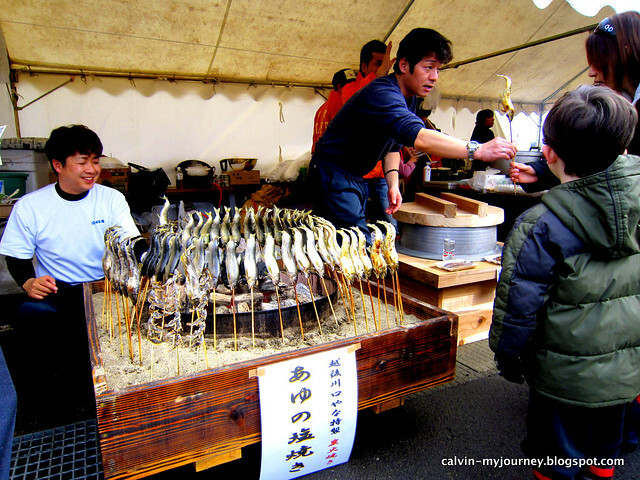 Grilled sweetfish or more commonly known as ayu (鮎). 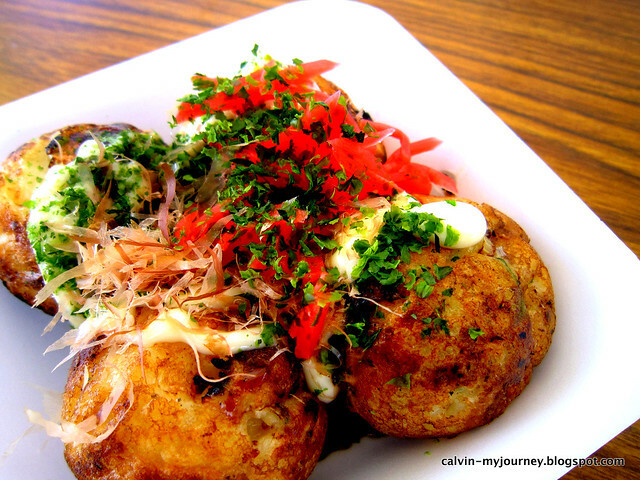 Ayu is too pretty to me, so I had some takoyaki for lunch. 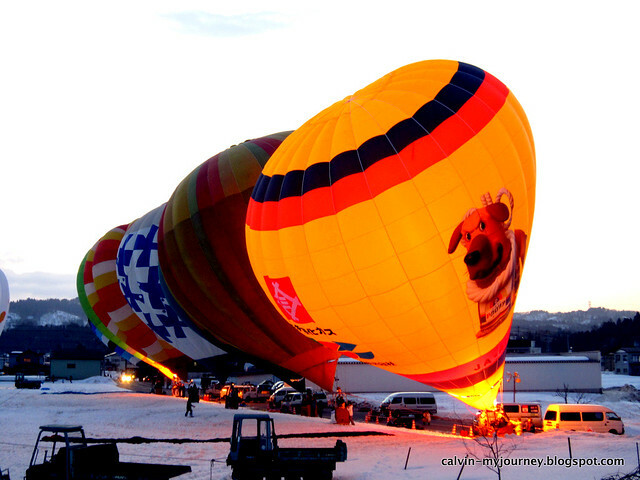 The main attention in this festival was undoubtedly the hot-air balloons. There were actually two venues where visitors can find them. However, I only went to one of them as both venues were separated apart from each other for quite some distance. The other one was basically used for hot-air balloons competitions. 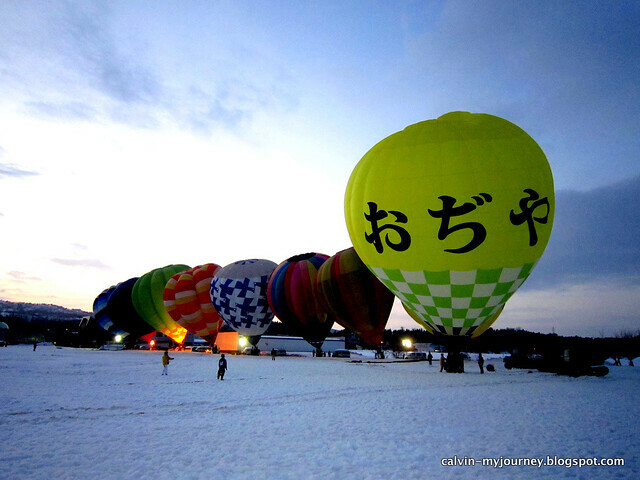 As for the one that was held nearby Jusco supermarket I went to, there were a few hot-air balloons prepared especially for visitors to experience a ride on them. As a person who is afraid of heights, I told myself not to put myself into trouble by trying to take a ride on the balloons haha! 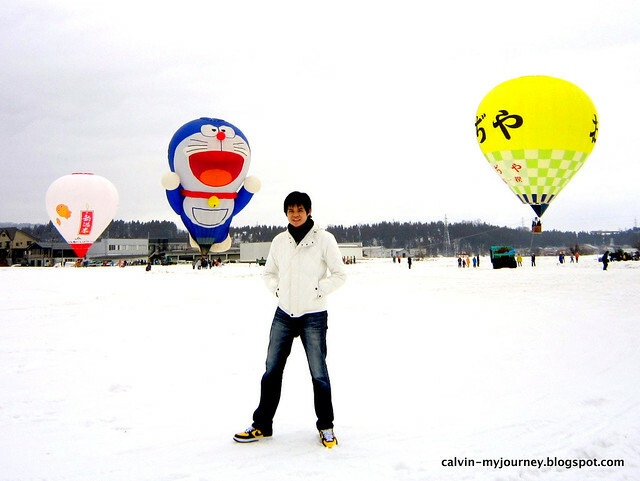 Those three hot-air balloons are designed for visitors to ride on them. Line of people queuing-up to hop into the balloons. Didn't get to ride on Doraemon, posing in front of them pun jadi-lah. 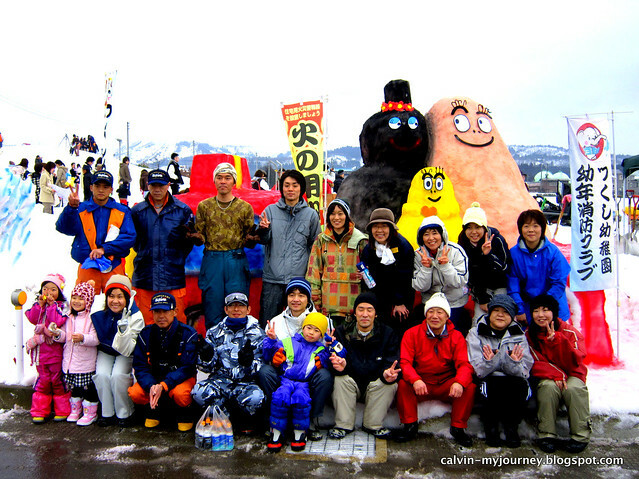 By the way, that Doraemon looks like it was trying to scare me off haha wtf! When the sun finally set, there was a long row of photographers fully equipped with their gears getting ready for something spectacular. More hot-air balloons were brought to the venue for the night event. 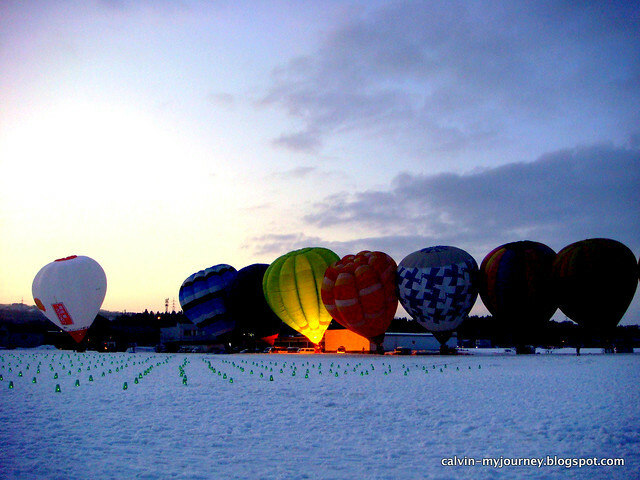 The hot-air balloons are aligned in one straight line, and the highlight for the festival was almost set to begin. If you'd noticed, there were also green lamps arranged on the snow field. Final few minutes before the event started, they made some last few tests to make sure everything is in order. 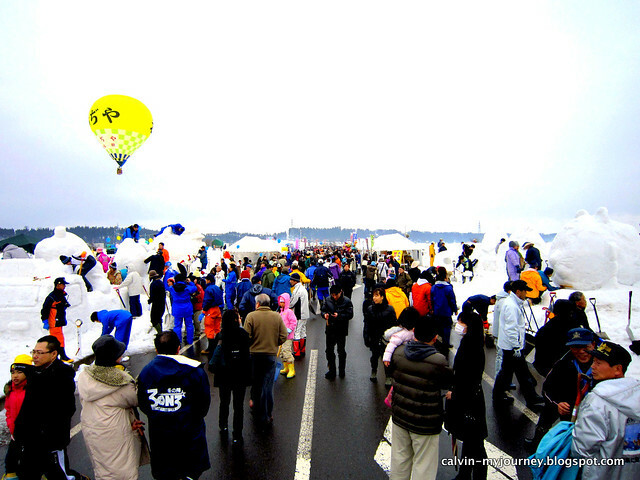 The highlight of this two-day "Ojiya Hot-Air Balloon Festival" was the event held on the first night, called the "Global Festival". 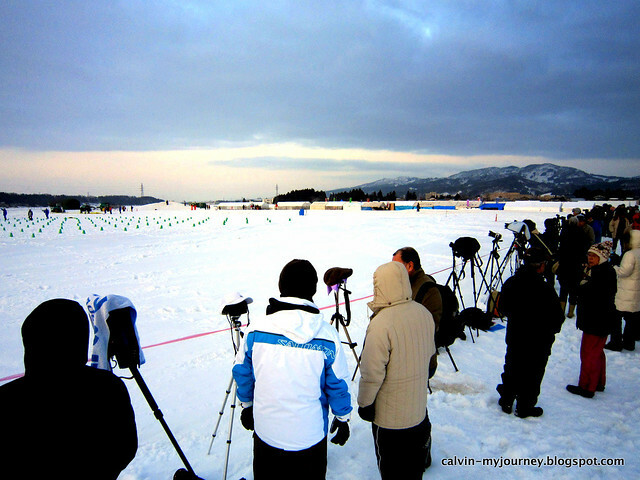 This is when hundreds of lamps are lighted up on the snow field. 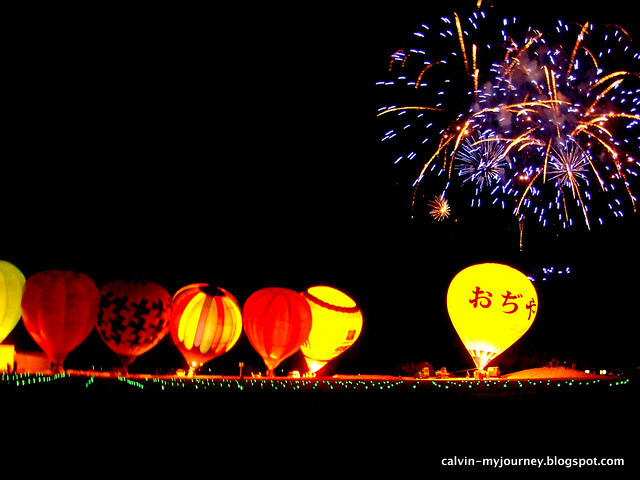 In addition to that, the beautiful fireworks, which are set up above the lighten up hot-air balloons gives a fantastic scene to wrap up the festival. When the fireworks show finally began, there was just one word to describe the scene - magnificent. 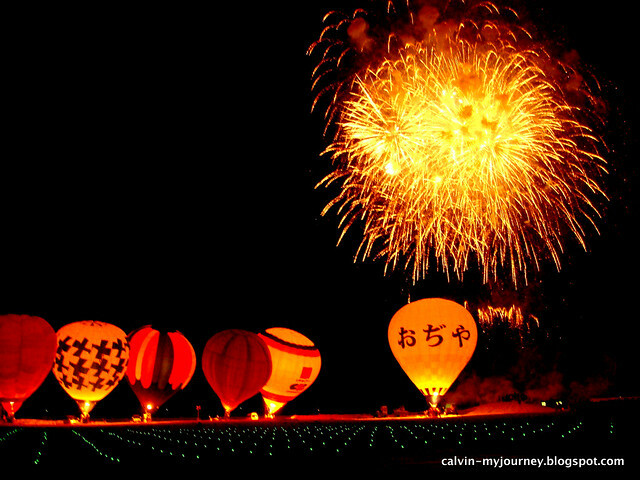 Hot-air balloons and fireworks - a perfect combination. Not a bad place to make a wedding proposal, ain't it? Thank you Ojiya for a wonderful and interesting day. lol! those ice sculptures looks like giant ice kacang/cendol!!! 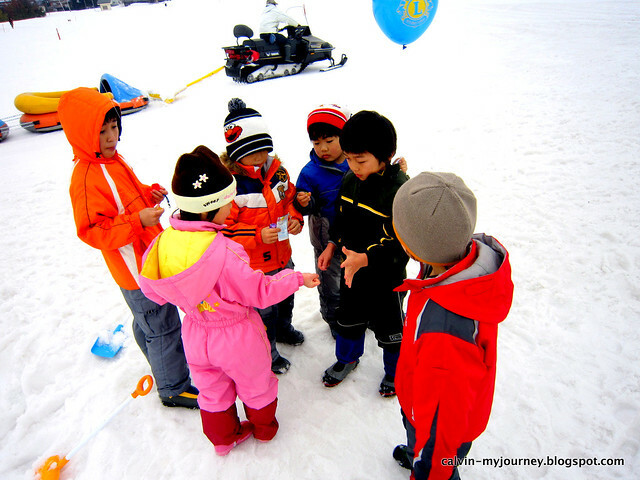 it will be a real rice kacang if we add some syrup, corns, peanuts, and extra atap chee on top of the snow sculptures haha! 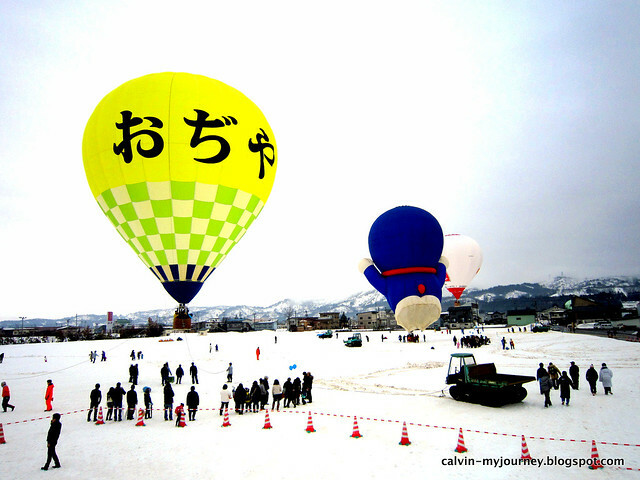 I want to visit the Ojiya Balloon Festivalthis year. Do they hv free shuttle to these places from Ojiya? Hello Suzanna! Yup, they plan to provide shuttle bus from Ojiya station to the venue. However, whether they are free or not, I am not very sure. For the rest of the entries, go to Archive. Click on the smilies button below this chatbox for some different smilies and have fun with them. Kindly post your comments in the COMMENTS' BOX. Thank you! Born and raised in a small town called Taiping (which means "everlasting peace" in Chinese) in the northern state of Perak in Malaysia, and had spent almost one third of his life in Japan.